Alert new customers to your brand with ePromos! Create a custom alarm clock inscribed with your logo to give your business the jolt it needs to generate new leads. Don't let your business sleep on opportunity. Match your brand identity and appeal to your customer base with travel, high-tech, and novelty clock options galore. These items make great gifts for busy employees and traveling professionals. Turn your marketing dreams into reality with help from ePromos' team today. A multifunctional promotional clock and weather station that makes a useful giveaway item. Wake up with this fun Light-Up Color Changing Custom Alarm Clock! This digital LED alarm clock displays the time, day, month and temperature while changing color. An attractive logo alarm clock that folds out to reveal an analog clock with alarm and weather information. At ePromos we give you options. We carry promotional alarm clocks to fit any budget from low to high-priced options. Fold-down travel alarms, fun desktop alarm clocks and backlit digital clocks are just a few from our collection. These perfect giveaways for tradeshows and events are battery operated and solar powered, so you’re not messing around with cords and power outlets. Imprinted clocks make great keepsakes for retirements, milestones, staff recognition or holiday gifts. Your employees will love to see how much you value their time when you give them a personalized alarm clock from where they work. Imagine having your business logo and message right in front of everyone's eyes in offices, meeting rooms or even in their homes. Branding a custom alarm clock is the perfect way to keep your company’s mission on your employees’ minds. After all, there's no gift more timeless or universal than a gift of time itself. Beautiful and practical, they're sure to stand out in the minds of partners and employees. 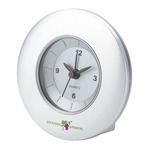 With ePromos, you can custom print your logo or brand name on these alarm clocks to advertise your brand. We carry clocks made of plastic and acrylic, leather and leatherette, glass and distinguished metals like aluminum. These materials are decorated with your logo by imprint methods such as screen printing, pad printing and full-color printing. You will find a personalized alarm clock that will be appreciated by your customers because our alarm clocks range from exquisite time pieces to multi-functioning desktop tools. Depending upon the office time keeper you choose, it can also be a desk caddy, pen holder or weather station. Find the custom alarm clock that's right for your company image. Custom imprinted with your corporate logo, these clocks and watches are popular and effective promotional tools. If you want to order online, our ordering process is easy. If you want some assistance or if you have any questions, you can call one of our Brand Consultants, send us an email, or use our chat feature. Maybe you want us to do some research and come up with new ideas. We can do that sort of thing! We want you happy with your first order and every order after that.